Deluxe Elmo Walker Costume.Includes: One Elmo Bodysuit.Available Size: Infant (0-6 months), Infant - Walker (12-18 months). (See Size Chart For More Information)This Baby Elmo Costume will let your child look like their favorite adorable little Sesame Street muppet! Costume includes a bodysuit with attached character hood. It's red and fuzzy, just like Elmo! Let your child bring their favorite Sesame street character to life with this Elmo costume! Elmo Headband.Includes: One Elmo Headband.Available Size: One Size Fits Most Adults, Teens and Children. *Costume and Accessories Not Included. Sold Separately. Hee hee hee! Elmo is just one lovable character, wanting to play with all his friends! If your growing girl wants to bring a little nostalgia to her Halloween gathering, or just wants to have a silly hat for some fun, then pick up this Girls Elmo Headband! 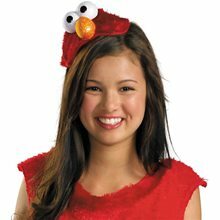 With the Elmo character headpiece, it'll look like her favorite Sesame Street character is always with her! So pick up the Girls Elmo Headband, and stay in our Sesame Street Costumes theme for some great Halloween ideas! Elmo Plush Jumpsuit Toddler Costume.Includes: Plush jumpsuit and character headpiece. Available Size: Infant (12-18 Months), Toddler - Small (2T), Toddler - Medium (3T-4T), Toddler - Large (4-6). (See Size Chart For More Information) *Socks and Accessories Sold Separately. This a full-fledged Elmo costume. Wearing this will make you child look as much like Elmo as humanly possible. The full length jumpsuit is made of red plush and the attached character headpiece has all of Elmo's facial details. Elmo is one of the most beloved Sesame Street Characters and small children will be very excited to dress like their favorite little red monster. 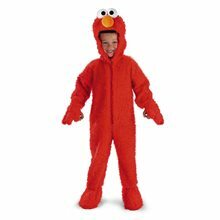 The Infant Toddler Sesame Street Elmo Comfy Fur Costume is a quality Halloween costume that will keep your child warm and cozy. 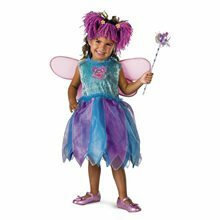 This is a costume that you can hand down to younger siblings or lend to friends. It is hand washable too, an added benefit with our sometimes messy toddlers! Dress-up as your favorite Sesame Street character in this Elmo Sassy Adult costume featuring red plush dress, red knee-high stockings with orange bow and Elmo character headpiece.Elmo Sassy Adult.Includes: Plush dress, knee-high stockings with bow and character headpiece.Available Size: Womens - Small (4-6), Womens - Medium (8-10), Womens - Large (12-14). *Shoes Not Included. Frilly Elmo Dress Toddler Costume.Includes: Dress and character headband.Available Size: Toddler - Small (2T), Toddler - Medium (3T). (See Size Chart For More Information)*Shoes and Accessories Sold Separately. Materials: Polyester.Got a little Elmo in you? Then this costume is for you! Join the cast of Sesame Street this Halloween with this super cute costume take on a classic character! 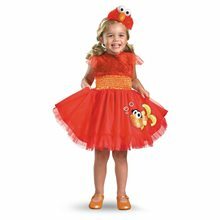 The Frilly Elmo Costume includes a dress with plush fabric top and full printed skirt and a character headband. Everything your child needs to be their favorite Sesame Street character!This is an officially licensed Sesame Street product. 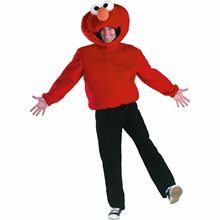 Sesame Street Elmo Adult Costume.Includes: Red plush long-sleeve shirt and plush character headpiece. Available Size: Junior - Boys (38-40), Mens - XLarge (42-46). (See Size Chart For More Information) *Pants and Shoes Not Included. Accessories Sold Separately. 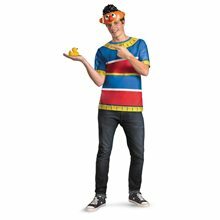 Features one red plush long-sleeve shirt and plush character headpiece. Does not include pants or shoes.This is an officially licensed Sesame Street costume. Become your favorite Sesame Street® character in this Elmo Deluxe Plush costume featuring red plush bodysuit with attached Elmo character hood.SESAME STREET - Elmo Deluxe Plush.Age Category - Preschoolers.Brand - Sesame Street®Character/Theme - Alien & Monster.Product Includes - Red plush bodysuit with attached character hood.Available Size: Toddler - Small (2T), Toddler - Medium (3T-4T).Content - Shell: 74% Acrylic 26% Polyester; Hood Lining: 100% Polyester (Exclusive of Decoration).Product Care - Hand Wash Cold Separately, Do Not Bleach, Line Dry, Cool Iron If Necessary, Do Not Dry Clean.TM and © 2009 Sesame Workshop. TM/© 2009 Sesame.